This watch is also known as: 49805-52-151-BACA , 4980552151BACA , 49805/52/151/BACA . 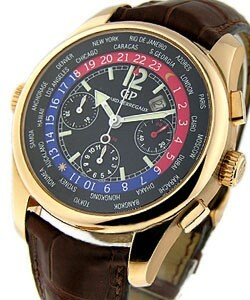 This Girard Perregaux World Time Chronograph features a 18KT Rose Gold 44mm case and a gorgeous silver dial. The Girard Perregaux Model #: 49805.52.151.BACA also includes a Brown Strap with Deployment and is driven by automatic movement.